Note: this page is a work-in-progress, so please check back for frequent updates! The #1 question that I receive from readers is “how do I start a blog…and how do I make money blogging?” If you’re looking to start your own blog, be sure to check out our series, How to Start a Money-Making Blog. This series will guide you step-by-step through setting up your blog and your web hosting with Bluehost, writing blog posts, social media promotion, growing your following, and ways to monetize your blog so that you can start making money! If you want to get started with blogging, this is a fantastic FREE resource that will walk you through the entire process! So, you want to know what equipment I use? The #2 question that I receive from readers is “What kind of equipment are you using?” along with “Where can I buy it?” Honestly, about 90% of all things that I purchase come straight from Amazon.com. The bulk of my days are spent homeschooling my three boys, so I take advantage of Amazon Prime’s free two-day shipping ALL the time to avoid having to drag everyone out and about with me. If you’re not an Amazon Prime member, you can CLICK HERE to get a free 30-day trial. Prime also includes thousands of free streaming movies, television shows, and music along with unlimited cloud photo storage, so for my family, it’s worth every penny! Now that I’ve covered where I shop, let’s talk about the equipment that I use. If you’re looking to purchase your first entry-level DSLR, I highly recommend the Canon EOS Rebel T5i or the Canon EOS Rebel T6i. The camera kits include an 18-55 mm lens that works exceptionally well for everyday photos and videos; however, I also recommend purchasing a 50 mm lens if you’re an aspiring food or creative blogger. The 50 mm lens allows for a much shallower depth of field (blurred background while keeping focus on the foreground), and will give you excellent low-light performance. The Canon EF 50 mm f/1.8 lens is the least expensive model (around $125), and recent improvements to the lens design have received rave reviews that put it on par with the more expensive Canon EF 50mm f/1.4 ($349). I shoot about 90% of my blog photos with the Canon EF 50mm f/1.4, and it’s my go-to lens for anything blog related. If you’re looking for a more advanced DSLR, you can’t go wrong with the Canon EOS 6D, and the Canon EF 24-70mm f/2.8L II USM Standard Zoom Lens is at the top of my wishlist! I also recently purchased a Sony a6000 mirrorless digital camera, and I LOVE it! The photos are fantastic, and the absence of the traditional mirror system makes it much lighter weight and easier to transport than a standard DSLR camera. I have been taking the Sony a6000 camera everywhere with me along with the Sony 30mm 2.8 lens, and it’s quickly replacing my Canon as my go-to camera! 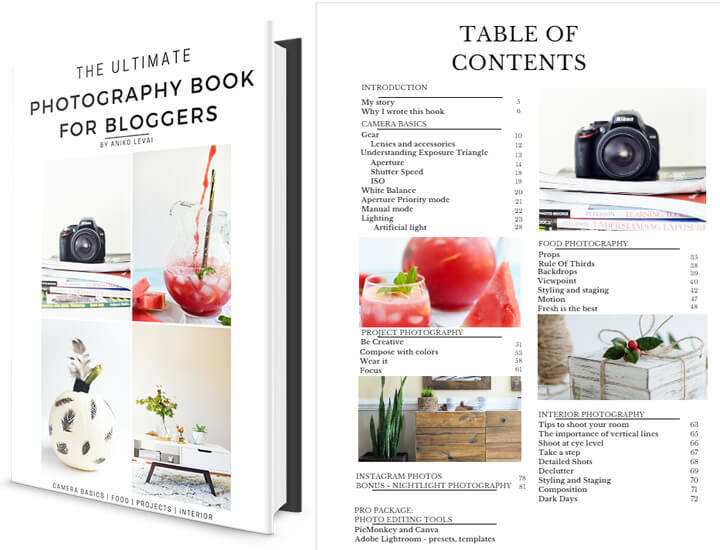 The Ultimate Photography Book for Bloggers by Aniko Levai is an amazing resource that covers everything from learning your camera settings to staging photos for projects, recipes, interior design and more. Definitely a MUST read! She also offers a package that includes Adobe Lightroom presets and templates for quick and easy editing of your photos. This is a fantastic resource!